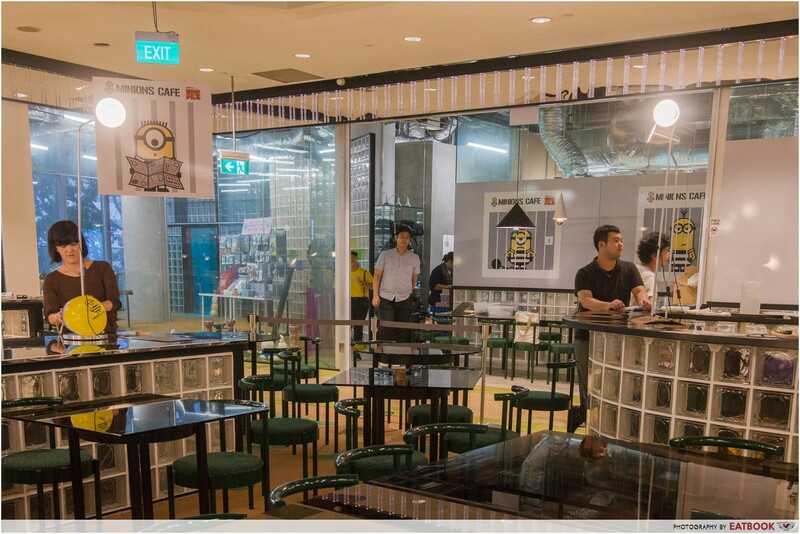 Update (1 Feb 2019): Minions Cafe is now permanently closed. The Minions, everyone’s favourite evil sidekick, are now here on our shores with a big bello! 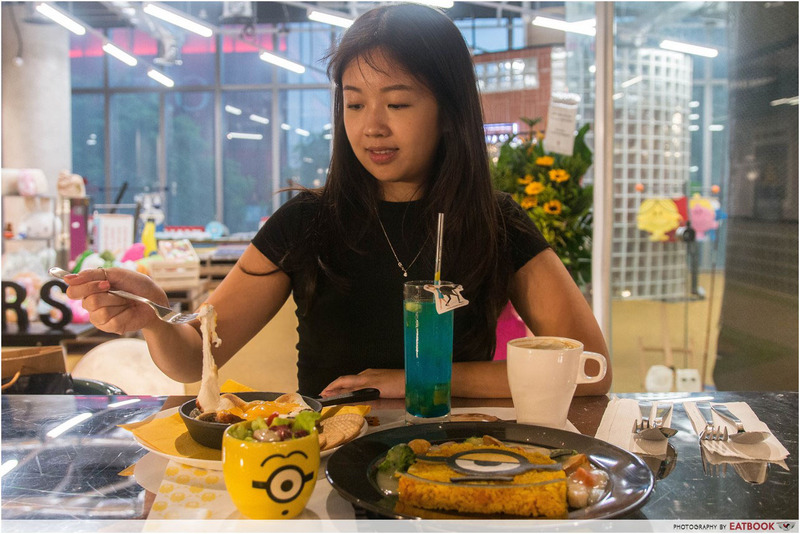 Only opened for a limited time from 23 November 2017 to 31 January 2018, this pop-up Minions Cafe showcases a menu fully decked out with 14 wittily named dishes. My colleague and I were anticipating the themed cafe like excited overgrown kids. We were pleasantly surprised that the interior looked more sophisticated than the kid-friendly image we had in mind. Getting all antsy, we couldn’t wait to get a taste of the adorably decorated grub. 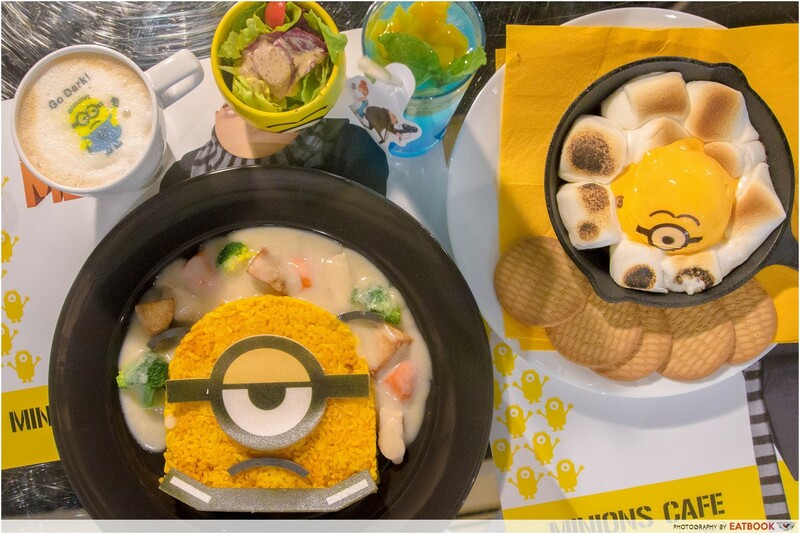 Minion’s Great Escape Cream Stew ($20.90++) was the first item we tried. 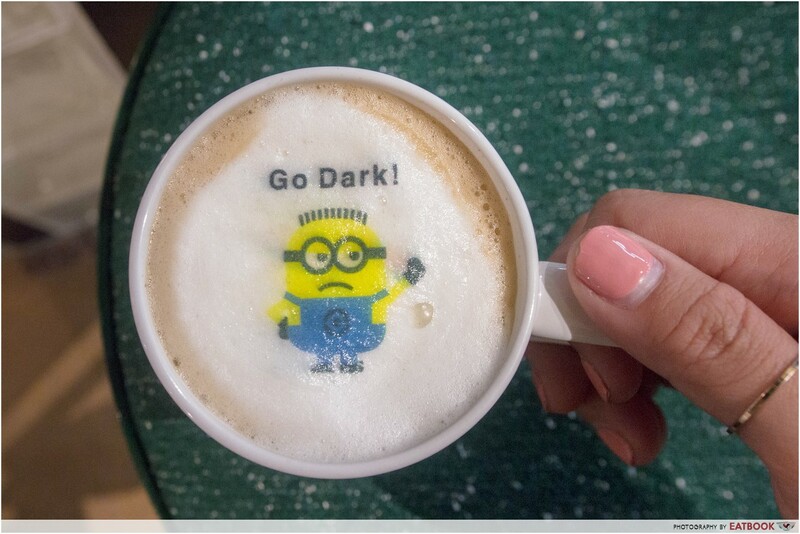 We squealed at the cute and totally edible portrait of Mel – the one-eyed Minion who always seem to sport an RBF. As the name states, it is a cream stew served with a packed layer of fragrant, yellow rice. The stew is made from a creamy roux. It was free from the taste of flour – which proves a well-worked roux. The addition of sweet vegetables such as carrots, potatoes, and broccoli, along with tender pieces of chicken balanced the mildly savoury cream sauce. “More stew please!” was the only thing I could wish for. It was as if Gru had a say in the kitchen, cutting down on the portion of the food going out to the guests. Their sweet overtones, coupled with savoury undertones, are tempered by the aromatic yellow rice. Nope, Mel was not artificially coloured or perfumed. I could taste the natural rich tone of turmeric that imparts a sometimes unidentifiable but delicious flavour to food. We had S’more & Minion’s Ice Cream ($16.90++) for dessert. 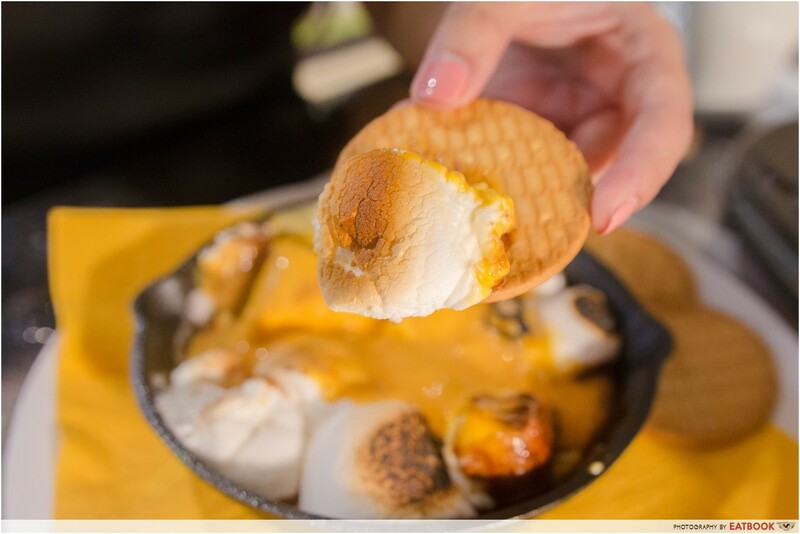 There is something whimsical about this dessert served in a cast iron pan. 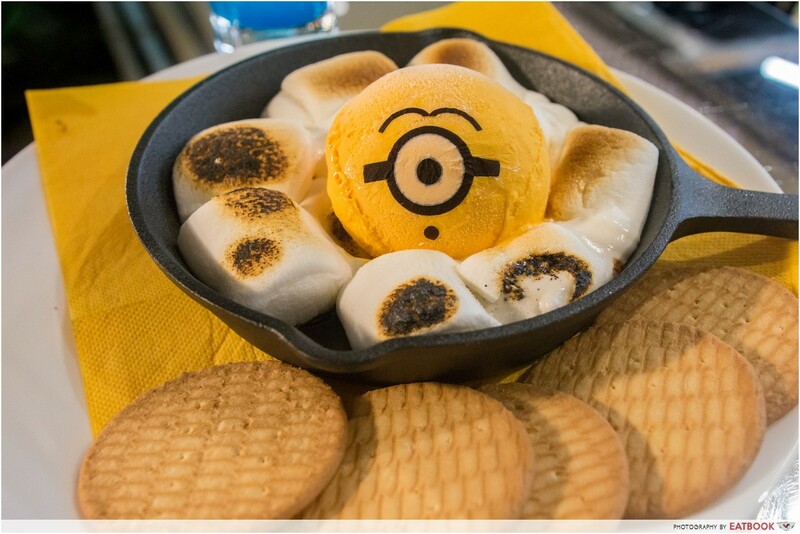 It features Stuart, the playful Minion with a rebellious streak, as a scoop of mango ice-cream in the middle of a bed of marshmallows. This dessert would be a sure-hit amongst the kids. You could even have a back story: Stuart being his mischievous and curious self, was dazzled by the fire. Screaming BEE DO BEE DO, he hopped into the pan just to realise he was about to turn into hot soup. Making s’mores was a feat. It was fun, but I can attest to the mess. Dipping the light tea biscuits into the concoction revealed a dark chocolatey surprise underneath the sea of white. As a sugar junkie who would choose sweet over savoury any day, this dessert was still too jelak for me. This melt-in-your-mouth dish would be more suitable to share with a group of friends. 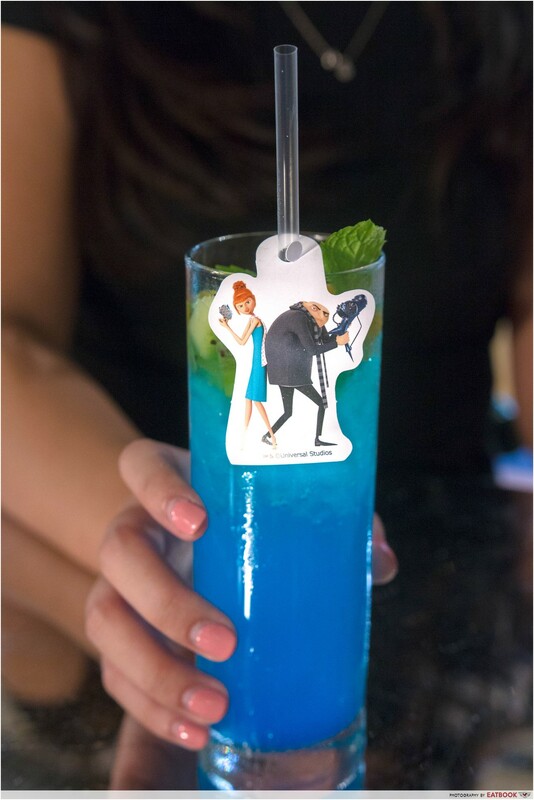 Lucy, the love interest of Felonius Gru, finally makes an entrance in this interesting drink called Gru & Lucy “Grucy” Soda ($8.90++). The drink is carbonated in a bright blue hue and topped with cubes of kiwi, mango, and mint leaves. Sadly it looked better than it tasted. I grimaced as I took a sip of it. My taste buds were engulfed in cloying and artificial sweetness. 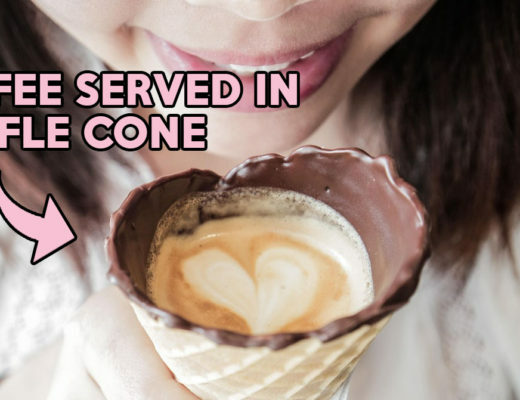 Give it a pass and opt for a light dessert like the Rescue Mel Affogato ($13.20++) instead. I was impressed by the depth of details that went into decorating the food. Even their Be Bad! Café Latte ($8.90++) is decked out with a darling picture of Phil on top of a layer of milk foam. The coffee was smooth and milky, perhaps intentionally made not too strong to suit the light-hearted and fun theme of the cafe. 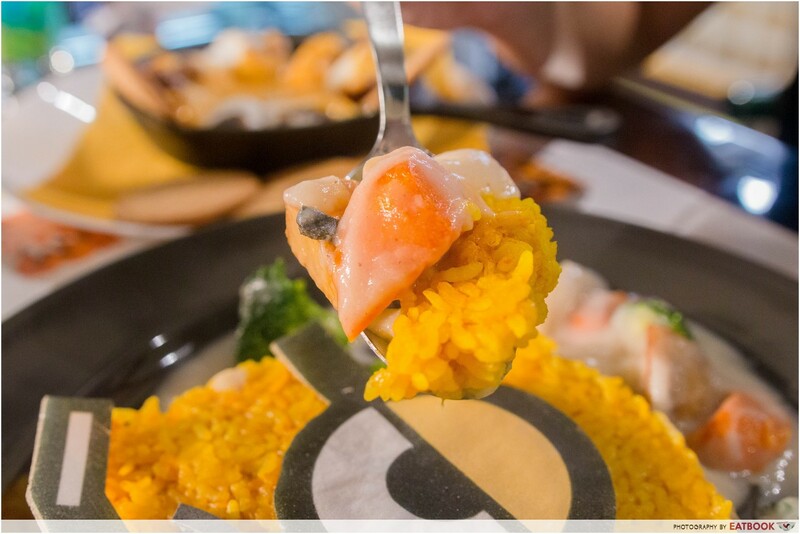 As I was looking around in the midst of tasting the food served to us, I couldn’t help but to wish the area would be decorated with more life-sized figurines like those that were seen at the Cartoon Network Cafe. 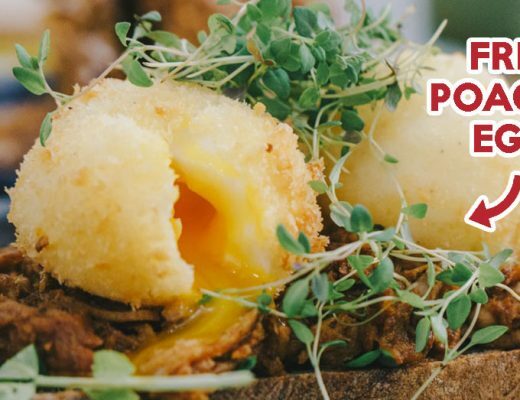 Perhaps the lack of those was because this is just a pop-up cafe, here to showcase the food more than the ambience. 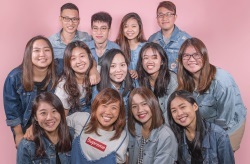 Don’t forget to check out the merchandise exclusively sold here at the cafe. You will not be able to find them elsewhere! 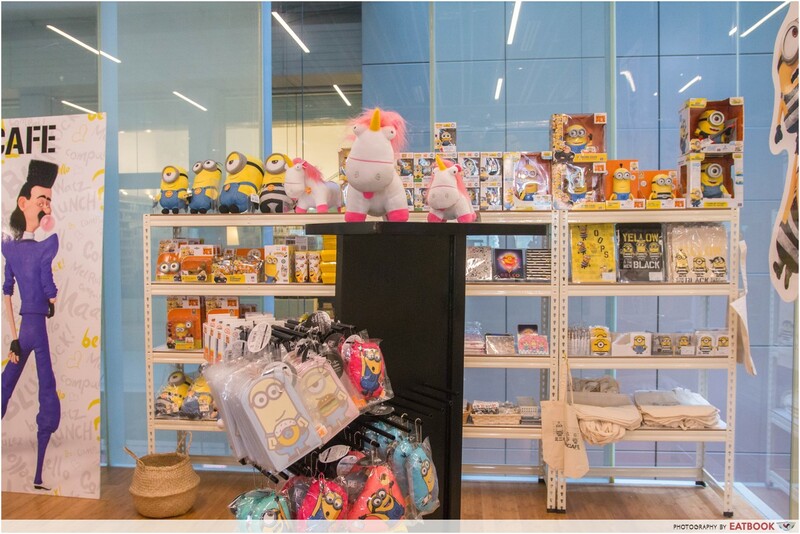 I was so tempted to get Agnes’ Unicorn plush toy when my eyes landed on one. My colleague and I enjoyed our time here as much as we thought we would. The food was not only a feast for the eyes, they also provided an element of fun. We expected the prices of the food to be steep as it is, after all, a themed cafe. Clearly, dining at one of these places comes with a price. Personally, this would be a one-time experience for me to do it for the gram, or just to make my Minion-crazed best friend happy for a day. I’m sure children would love to spend a birthday meal here too! 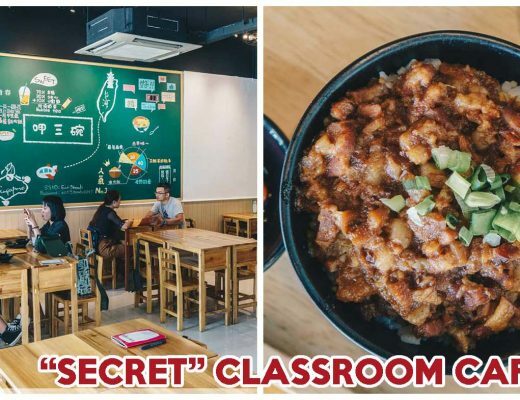 If these hysterical characters are not enough to feed your love for movies, here is a list of themed cafes you can check out as well! 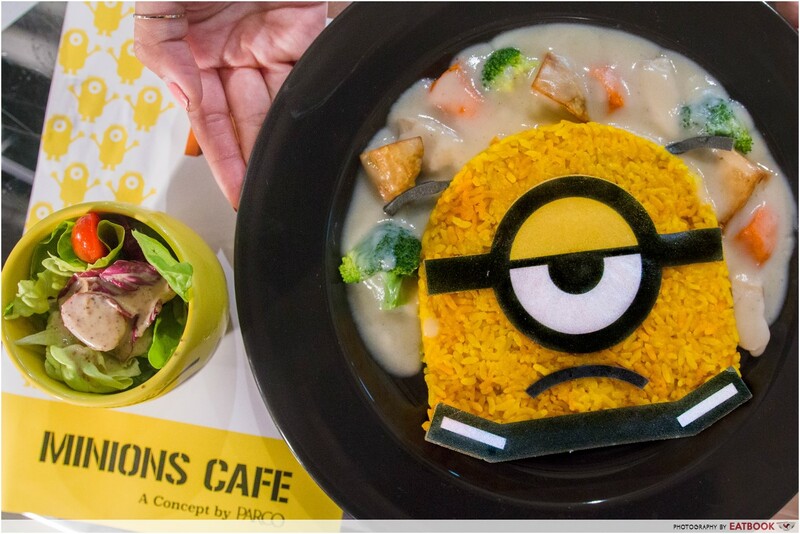 This was a media tasting at Minions Cafe.